Before Saton came Vifinity, before Vifinity there was darkness. Or maybe silence would be more accurate. as a replacement. 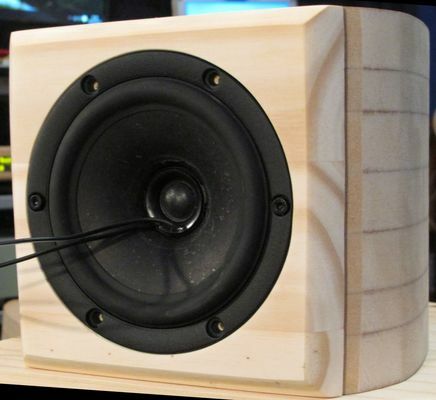 Not that I had anything against the previous design I just wanted to build another loudspeaker. Ever since SB Acoustics released the original 6" MW16P I had always wanted to use one of them. SB Acoustics standard line of drivers already had, by most standards, world class motors and I was intruiged to see how they were going to justify the Satori, premium, range, at no doubt an increased price. Sure they looked pretty but so do lots of things in life that turn out to contain little substance once beneath the exterior. Of course the Satori's pretty behind wasn't just attractive it served a functional purpose too in reducing the size of the obstable that the rear wave comes into contact with first. Then the third party measurements came in and these showed a motor of remarkable performance. SB had actually done it. I was impressed and added another driver to my 'must someday use' list although I didn't quite realise that in doing so I'd actually end up butchering the driver in the process. Given my exploits with the B&W FST driver, I decided that I wanted to give this another go. I still had the modified ND16FA-6 tweeeters sitting on the shelf and thought that my soldering area would certainly benefit from the coherent radiation pattern that a coaxial can provide so I set to finding woofers that would suit. 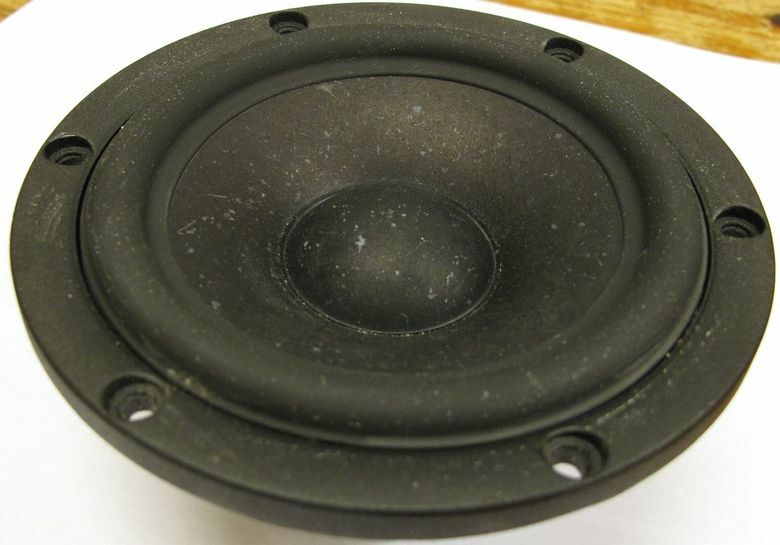 The FST drivers have a voice coil diameter of 30mm, so something similar was to be required in a driver of 4-5". After a considerable amount of searching and pdf browsing I came up with two candidates. The MW13P from SB Acoustics and the NE123W from Vifa. Both of these drivers are surprisingly similar. Both use composite paper cones, both have compact neo motors and both have very open baskets that make using the driver in tiny cabinets less of a problem. Given the size of both drivers a crossover in the region of 3-4kHz would be required to provide a decent directivity match to the cone loaded ND16. This would fit in well with what the ND16 is really capable of but would require a driver with an absence of distortion amplification due to cone resonances, so metal cones were squarely rules out. Both drivers still fit the bill so what this basically came down to was personal preference. The NE123 was cheaper and slightly smaller whereas the Satori promised better linearity at greater expense. Given that the speaker isn't called Vifon, which choice I made should be pretty clear by now. A pair of MW13Ps of the 4 ohm variety were henceforth ordered. The 4 ohm variety was chosen because its T/S parameters suited a smaller box better than the 8 ohm. I already had the cabinets lying around from a previous experiment so very little was required in order to make these work. The NW13Ps arrived and what beauties. These drivers are built incredibly well built and feel like you've definitely got your monies worth. The front side of the Satori 5" driver showing the speckled paper cone. And now the rear side of the cone showing the machined motor parts and open basket design. One thing to point out here is that the continuation of the basket struts, down onto the silvery motor parts, is actually made of rubber. This is a very nice touch. Not only does it complete the look of the driver but it also helps to dampen any resonances that could otherwise occur in the structure of the driver. A few cautious moments later and we have the above. Note the copper ring used above the pole piece. This is one of the reasons for the Satori's stellar motor performance. That was a relief. The dustcap was easier to remove than I thought and the space beneath showed a decent sized cavity. It turns out that there is just enough room for the ND16 to sit atop the ridges of the copper ring. So the drivers were then mounted and measured. Above is the measurement for the tweeter performed ever so slightly off axis. Nothing really surprising here. Coaxially mounting the tweeter loads the driver with the cone of the woofer. This acts like a waveguide and results in a similar hump towards low frequencies. 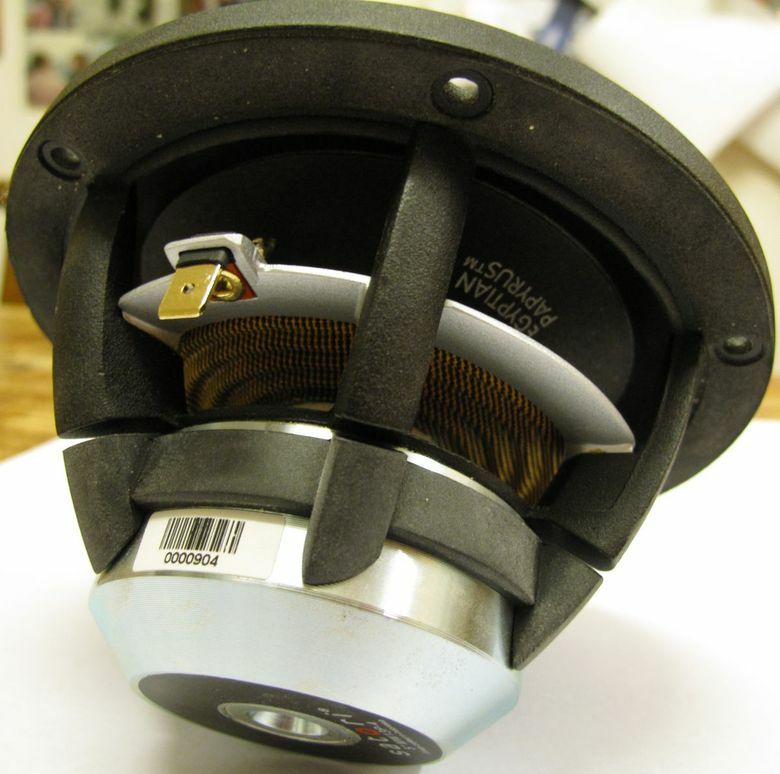 Unlike a nicely shaped waveguide though the transition from the woofer cone to the basket is usually separated by a half roll surround. 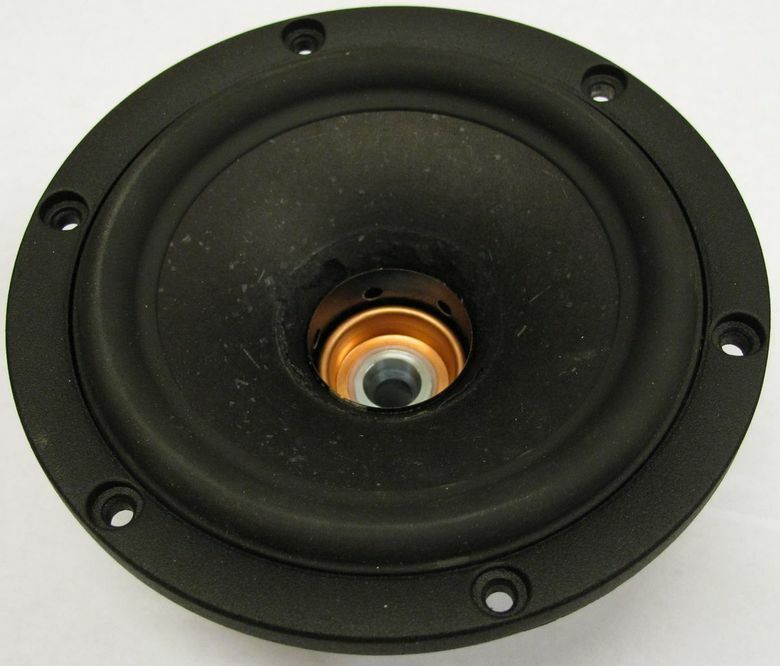 KEF, TAD, Pioneer, and more recenetly SEAS, have all worked to great lengths in order to reduce the effect that the surround can have on the tweeters performance. The easiest way around this is to simply restrict the frequency range that the coaxial part of the system works over. Use the coax as a midrange and you reduce its excursion demands, reduce its excursion demands and you can use a flat surround, the flat surround in turn provides a much smoother frequency response. All that aside though the frequency response is decently flat all apart from a notch in the top octave that disappears off axis. 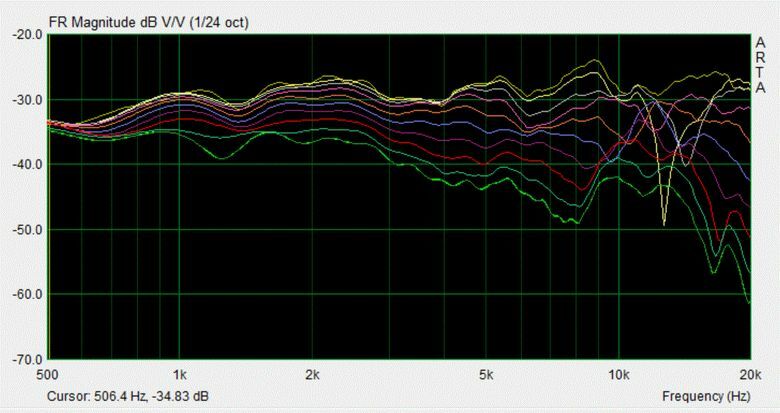 Here is the frequency response of the Satori woofer. Note that this is only the farfield response. As can be seen the driver goes through some pretty severe breakup centred on ~7kHz. With the associated dip beforehand this looks quite similar to how some metal cones can perform. The cone of the MW13P is indeed very stiff to the touch, surprisingly so, but distortion measurements confirm that the driver does not exhibit any distortion issues like metal cones do. Indeed I have only added in the distortion measurement for academic purposes as there are other measurements of it around the internet but this is what I was talking about with regards to its motor design earlier on. The high order distortion products are extremely low and the third order is ridiculously low when compared to other drivers. The only fly in the ointment is the hump in second order distortion at 1kHz which can be attributed to the cone edge/surround resonance found regularly in soft cone drivers. I would love for SB to make a metal cone Satori driver, the MW13P may have a stiff cone but it certainly doesn't behave like one. The crossover design for this system was somewhat different compared to standard passive two ways because the system that these were to be used with includes a DSP. This doesn't mean that the entire crossover can be handled digitally, just that certain parts of it can be. 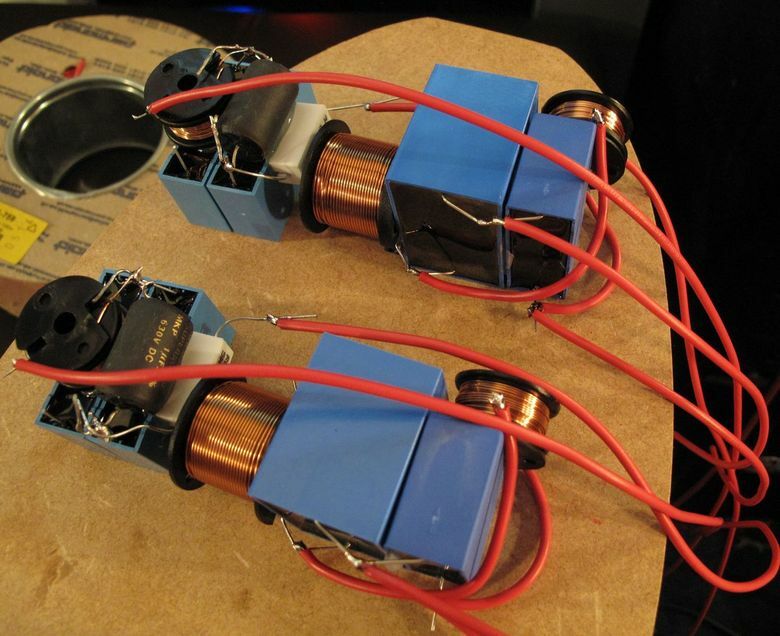 The design goals here were to design a simple passive crossover that would integrate the two drivers with respect to phase and to integrate the drivers at a suitable frequency so as to provide a good directivity match and thus nice off axis performance. What wasn't needed was any compensation for baffle step, or real attention to top octave balance. Both of these could be addressed with the DSP later, but obviously response flatness would be a bonus. Steep 4th order slopes were decided upon with the target crossover somewhere between 3 and 4kHz. The small tweeter requires steep slopes to function properly and the humongous breakup of the MW13P really needs a steep xover to push it well out of band especially when used with a high xover point. Above can be seen the simulated frequency response. Not the smoothest around but still within reasonable +-2 dB or so limits. Below is the reverse null. These were not an easy pair of speakers to design. The crossover was quite a faff to bring into decent phase alignment. As can be seen quite asymmetric slopes needed to be used. Below are the crossovers for the tweeter and woofer, the associated transfer functions and the input impedance. As can be seen above there is nothing unusual about the crossovers and the impedance shows that the loudspeaker is very easy to drive. The woofer did require a 4th order electrical network, something us designers try to stay away from, to provide the level of response shaping that was necessary. No doubt other topologies would have also worked, but this one only required small sized components to realise. Of course if baffle step had been compensated for much larger inductors would have been necessary. A pile of xover parts. Above are the finished xovers sitting on top of one of the cabinets and showing the overall shape to the cabinet. 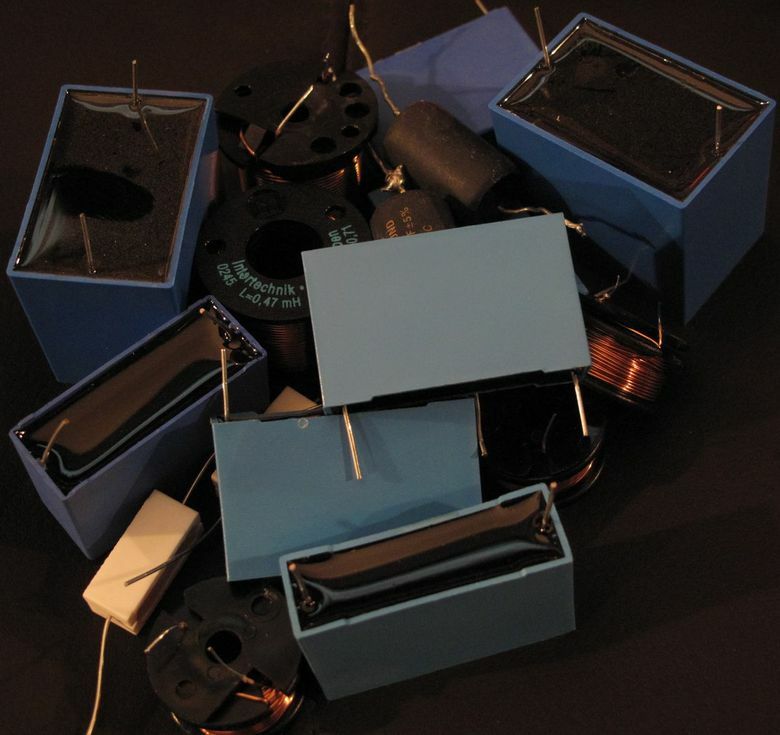 Polypropylene capacitors were used alongside air cored indcutors. Given the nature of the design I thought it prudent to provide a final set of off axis measurements. As can be seen the drivers are integrated nicely and provide a uniform, smooth off axis response throughout most of their operating range. The only real issue is that which happens in the top octave. The top octave is quite surplus to requirements though when it comes to overall audio quality. There is very little 'information' as it were up that high, both in terms of localisation cues for stereo perception and that there are only going to be overtones from actual instruments present. Lots of us cannot even hear that high, but those of us who can merely perceive the top octave balance as a loss or overemphasis of 'air' or 'brightness'. The top octave looks an off axis mess, but simply tilting the top octave up or down is very effective in addressing how this region of the speakers actually sound. In practise I chose to tilt it up ever so slightly. Below can be seen the final on axis frequency response before any EQ has been applied. Although the box used here is relatively small I did decide to port it. This results in a somewhat peaky underdamped alignment. If the speakers had been designed for stand alone listening this would not have been a good idea. Here though the system uses a modified KEF Kube 1 subwoofer to augment the bottom end. The signal source for the system uses a pair of DAC chips so that the signal being delivered to the subwoofer is completely independent to that of the main loudspeakers. 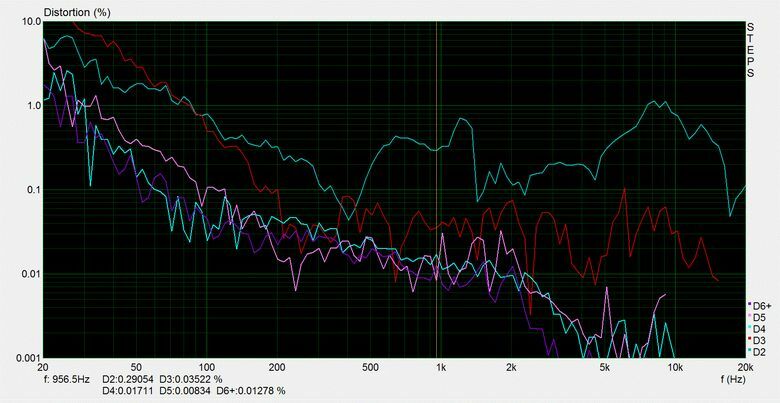 As a result the DSP within the DAC for the main loudspeakers equalises out the peaky response and provides a highpass function. This results in increased efficiency about the port tuning and reduces the overall excursion of the driver at the bottom of its intended operating range. Without the subwoofer the system obviously lacks for bass, but with it engaged it's very nice to listen to.